Charcoal, as an energy with high caloric value, has become the preferred fuel in various processing industries. More and more wise manufacturers rack their brains finding new method to produce artificial charcoal. After constantly development and improvement, Beston Group has made a new breakthrough in this respect. The charcoal making machine for sale is the most outstanding representative work. The machine is also named carbonizer machine, biochar production equipment, etc. 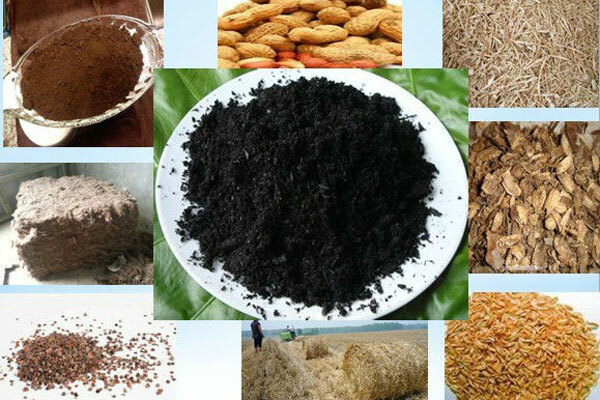 Beston charcoal maker machine mainly uses biomass waste as raw materials, such as rice husk, coconut shell, wood, sawdust, etc. Besides, the machine can be also used for disposing sewage sludge or MSW, which is the so-called one machine with multiple uses. 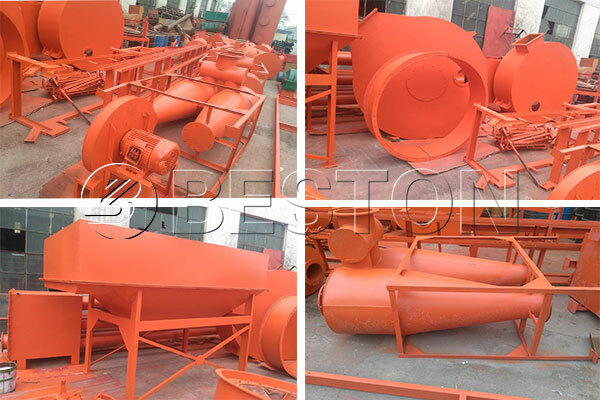 Nowadays, Due to the reasonable price, unique design and first-rate service, Beston charcoal making equipment has attracted more and more foreign friends to cooperate with us. 1. According to the size and moisture of raw material, the charcoal production equipment will install crusher or dryer device, which is beneficial to improve the working efficiency and the quality of end products. 2. 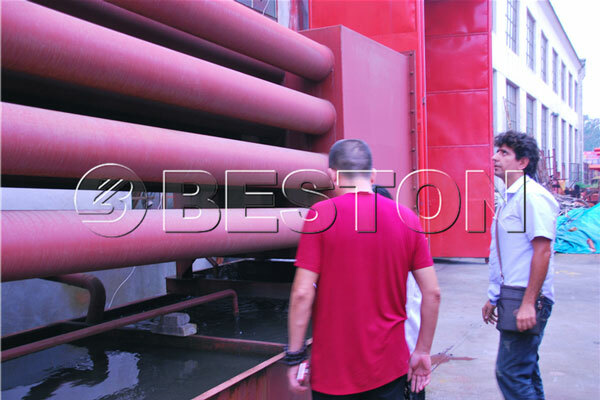 The raw material will be conveyed to carbonization furnace to be heated by high temperature. In this step, the raw material will generate combustible gas and charcoal. The charcoal will pass through cooling system to reduce the temperature, which is safer to collect. While the combustible gas will be purified by spray and cyclone dedusting system to remove sulfur. 3. The combustible gas will enter the condenser system to be liquefied into tar and wood vinegar respectively. The light combustible gas will be recycled to provide heat energy for furnace and dryer by draft fan. During the whole charcoal carbonization process, we can fully utilize the resources and avoid wasting. Meanwhile, the installation of dedusting system also can guarantee the environment protection and green production, which can obtain supporting from the government. As mentioned above, the raw material will be converted into charcoal, tar and wood vinegar through a series of process, including high temperature carbonization, flue gas volatilization, sulfur release and charcoal enrichment. Each of the end products has its own value. The charcoal is a kind of popular energy in recent years, and it can be used as fuel or additive in living, industrial and agricultural areas. Both of the tar and wood vinegar belong to chemical materials, which are always used as raw materials in many chemical industries. The biggest sales point of Beston charcoal production plant is the technology of one fire with two applications. The combustible gas can be fully utilized in the whole production process. At the beginning of 30 minutes, we always use traditional fuels to preheat furnace, and after that, the combustible gas is the major fuel to be constantly recycled for heating charcoal carbonization furnace and dryer, which has thoroughly realized energy self-supporting. This kind of advanced technology can not only achieve energy-saving, but also can realize the goal of cost reduction. a. Our charcoal machines have been equipped with superior dedusting system, which can fully remove the hazardous components of combustible gas. Moreover, the purified combustible gas can be recycled, and we have specialized tank for tail gas, so the whole process have no pollution and also can meet the EU emission standard. b. As for the carbonizer design, each part of charcoal making machine china is made of excellent material to reduce the occurrence rate of accidents. c. Our machine also has been equipped with cooling system to decline the temperature of charcoal, which can avoid the spontaneous combustion of charcoal. d. The surface of furnace has covered the casing which can prevent workers from scald. The whole process of Beston charcoal plant has fully realized the automatic production, which has largely increase the working efficiency and the production yield. 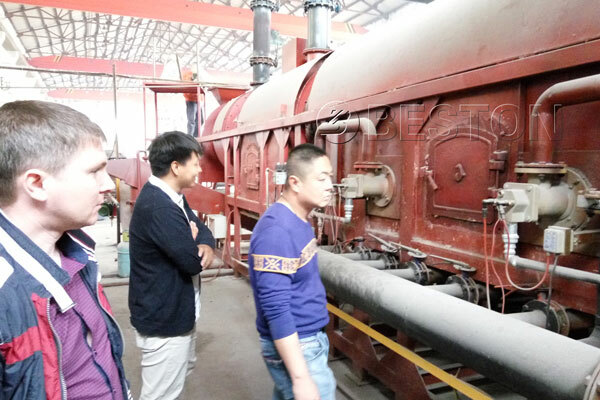 Moreover, the charcoal production machinery has been equipped with excellent supporting plants such as charcoal ball forming machine, which can have a further processing for the charcoal to increase its market sales values, and is also helpful to create high economic benefits. What’s more, the charcoal making machine price is quite reasonable when compared with other charcoal making plant manufacturers’ quotation. 1. The size and moisture of raw material should be less than 50mm and 20% respectively. 2. The temperature of carbonization furnace for charcoal should be kept between 650 and 780 degree centigrade. 3. The charcoal should be discharged below 30 degree centigrade, so the cooling system is necessary in the operating process. 4. The production yield is usually 4:1 or 3:1. Due to the different raw materials, so the charcoal yield is also different. 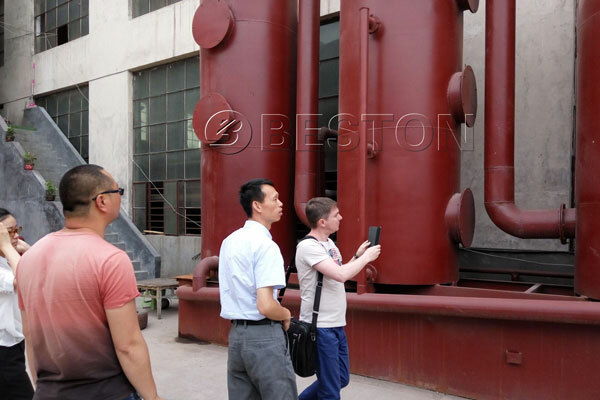 Beston charcoal machinery has possessed rich exporting experience and has spread to every corner of the world, so we have enough confidence to provide the best machines for you.